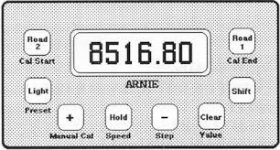 ARNIE Trip Meter - Reverse Version with 1M Resolution. For the Arnie trip to work the automotive electrician needs to be able to locate & connect to the speed output signal of the car. Mechanical Set up: Your Auto electrician may be able to supply & install sensors for the drive shaft and connect it to the Arnie Trip meter. GPS based Solution: You might consider connecting your existing Trip Meter to the GPS Speed Sender & Magnetic Mount.